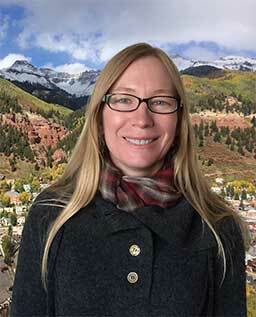 Lara Knoerr, broker and owner of Exclusively Real Estate, Ltd. has called Colorado home for more than 20 years. Lara obtain her degree in Mechanical Engineering from Valparaiso University and worked as a sheet metal processing design engineer. Shortly thereafter the Colorado powder and bluebird days called her home. Since moving to Colorado, Lara has been a vibrant member of both the Breckenridge and Telluride communities with her entrepreneurial spirit. Owning and operating with her husband, a Computer Engineer, many successful technology and marketing companies in the Rocky Mountains prior to opening Exclusively Real Estate, Ltd has enhanced her business experience. Lara is known for her professionalism, analytical perspective and a straight-forward approach that achieves results ensuring the job is done precisely. Additionally, Lara volunteers for the Telluride Adaptive Sports Program and is a snowboarder guide to her visually impaired, cancer survivor husband. Some of Lara's other interests include hiking, mountain biking, backpacking, scuba diving, hang gliding and river rafting. Many clients have found her experience, market knowledge, and negotiation skills to be invaluable. Put her experience, trust and world class service to work for you. Lara has a very diverse client list consisting of people from all walks of life that have bought and sold a wide variety of properties with a focus on luxury Ski Resort real estate from income-producing to family dream home.